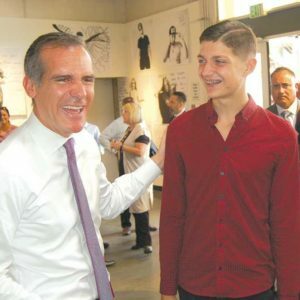 Mayor Eric Garcetti joined young people from the Los Angeles LGBT Center on July 9 to call attention to the HIRE LA’s Youth program, which provides internships and summer jobs with the goal of linking youth with permanent employment and careers. The HIRE LA’s Youth program launched in 2013, and last year matched 17,000 young Angelenos with summer jobs and internships. Garcetti announced a goal of linking 20,000 youth with jobs by 2020. 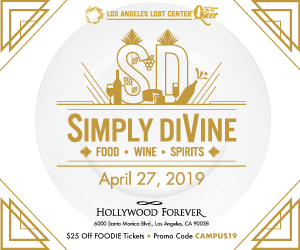 Los Angeles LGBT Center CEO Lorri L. Jean said linking youth with jobs is important because it gives them a foundation for success, and perhaps most importantly, hope for the future. Travis Crown, a 19 year old who spoke Monday during the press conference at the Los Angeles LGBT Center’s Village at Ed Gould Plaza, said finding employment was a “lifesaver.” Crown said last year, he was kicked out of his parents’ house because he was gay and ended up on the streets of Hollywood. The Los Angeles LGBT Center provided shelter and linked him with an internship through the center’s partnership with HIRE LA’s Youth. Crown worked with fellow LGBT youth in the center’s sexual health education program, which led to him securing a permanent position working with peers at the center. He starts next Monday. 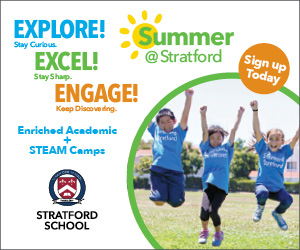 The program is for youth ages 14-24 and is open through the end of July. Interships generally last six weeks and are with companies in the entertainment, tech, transportation, health care, hospitality, government and financial services sectors. The program also offers training, mentoring and financial literacy coaching. Many of the positions are paid. For information, visit hirelayouth.com. Garcetti also encouraged businesses to get involved with providing the internships and summer jobs. Business owners seeking information can call (213)744-7333.